According to the scientist P.O. Fanger, our perception of comfort mostly depends on our activity, clothing and the properties of our thermal environment. When it comes to hot climates, there are two main ways indoor comfort can be achieved when it’s warm and possibly humid outside. This is the traditional approach in many regions. Buildings are kept open to ensure that high volumes of air can flow throughout. These draughts help to keep your body cooler through the process of evaporative cooling on the skin. You could use stack ventilation to get even better results. This is often a well thought-out way of ensuring bearable indoor conditions. However, it remains highly dependent on outdoor temperatures, humidity and wind speed. In certain climates, temperatures can exceed 40 °C and the humidity ratio can rise to 25 g/kg. Many residents are no longer willing to accept these levels of comfort, probably because they are used to air-conditioned cars, shops and indoor public spaces. 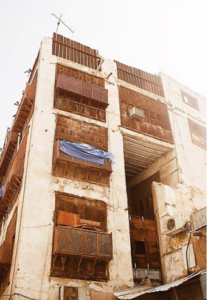 As a result many traditional buildings in hot climates have had air conditioning units installed, but this is neither energy efficient nor particularly comfortable. Another approach is to separate the interior from the exterior and keep windows closed when it is warmer and more humid outside than desired for the indoor conditions. 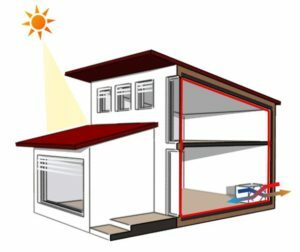 The Passive House Standard follows this approach and is able to provide indoor temperatures below 25 °C along with comfortable humidity levels (max. 12 g/kg (≈60% rel. air humidity)), whilst simultaneously keeping energy demand low. But how is this possible? The need for cooling relates to unwanted heat in the building. There are two types of heat loads that affect the need for cooling, internal and external. You can limit internal heat gains by choosing energy efficient appliances and electronic devices. You should also pay attention to the electrical efficiency of the ventilator’s fans. In addition, don’t forget to properly insulate warm water pipes and tanks to avoid unwanted heat in the rooms – in very hot climates it might be best to install the water tank outside the building envelope. Regarding external heat gains, you need to have sufficient insulation levels, especially in the roof (insulation does not “create” any additional heat!). If the building envelope is exposed to a lot of solar radiation, then using cool colors for the exterior surfaces is recommended. Airtightness is also important to limit unwanted heat and humidity gains through leaks. Installing fixed or movable shading can also significantly limit external heat gains. Finally, you will need an efficient ventilation heat and/or humidity recovery system. This will depend on the climate but it acts to prevent too much warmth or water vapor from entering the building through the fresh air flow. Depending on the local climate, various strategies may be employed: Window ventilation is a great option if outdoor conditions are similar to the desired indoor climate (night flushing). It is, however, not advisable if the outdoor humidity level is high, if it is very noisy, if the air quality is bad or if there is a risk of burglaries. Planning tools such as the PHPP are able to correctly identify when opening windows overnight would increase the cooling load due to the need for dehumidification. If the ground is relatively cool you could also use it to cool down the incoming air before it enters the building via a subsoil heat exchanger. As a rule of thumb, the ground temperature several meters below the earth’s surface is close to the average air temperature over the whole year. The remaining cooling demand and load would be much smaller than in conventional buildings. You may be able to use the ventilation system to distribute the cooling demand or otherwise use much smaller split units. These can operate at very low air speeds (enjoy the silence!) and supply air at higher temperatures, thus ensuring more comfort at lower operational costs! Alternatively you could also choose concrete core activation, which is especially good for bigger buildings and dry climates. All these options are currently being tested in the first Passive House in Dubai. In humid climates, additional dehumidification may be required. Want to learn more? Check out the Passive House Institute’s e-learning courses and in-class training offers. If you want to learn how to design and optimize Passive House buildings worldwide, our next Certified Passive House Designer course is what you’ve been looking for! cool, dubai, e-learning, energy, hot climate, house designer, passive house, steps efficient, tips, training. Bookmark. 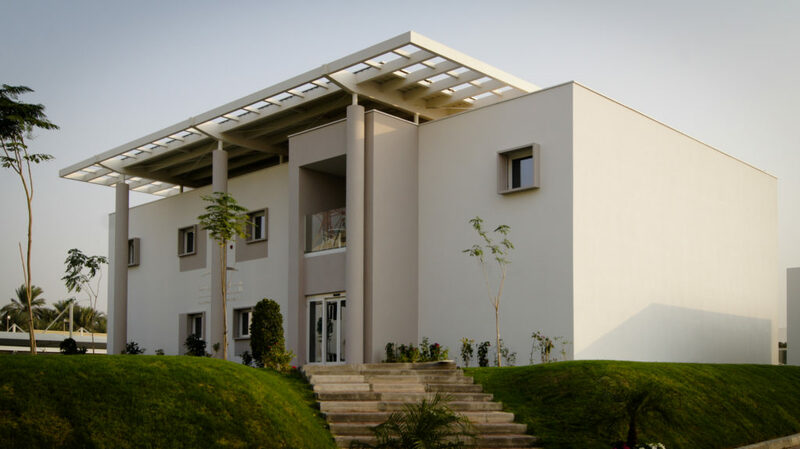 What is a Passive House building? Very interesting und helpful article about conditioning. Thanks so much.